The vineyard out behind our house is full of wildlife. We see rabbits, deer, and the occasional fox. There are also rodents and insects galore, and these attract the hunting birds. We will often see hawks circling above the fields looking for prey. We see pheasants and partridges in the fall and hear the spring cuckoos when they arrive in March. Crows like to sit on the vine posts in the morning, like the one below. My zoom lens isn't good enough to get a real detailed close-up. Recently, a mating pair of col-verts (mallard ducks) has been hanging out in the little pond outside our back gate. We also see herons in there from time to time. 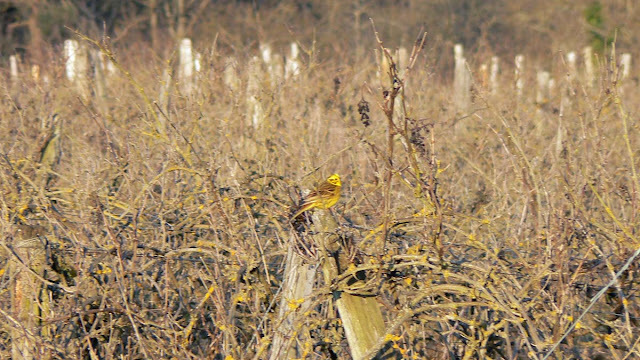 A few days ago, I saw this unusually bright yellow bird (below) among the vines. I've tried to identify it with my bird books, but I'm having trouble finding a close match. It looks like it might be some variety of finch, given its body size and shape. 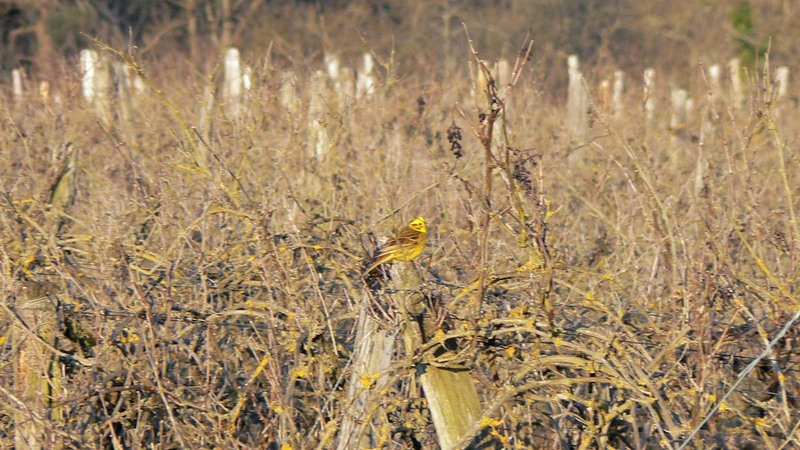 Not the best shot; the bird would only let me get so close before flitting off to another post. We see finches all the time around the house and garden. Chaffinches and goldfinches mostly. I don't remember seeing a bird like this one around the house. Maybe it's the breeding color of a more familiar bird? Any help from you birders out there would be appreciated. I think this plant is called une corydale, but I have no idea which variety it is (there are many), nor what it would be called in English. Wikipedia has an entry for corydalis which comes from the Greek meaning "crested lark." 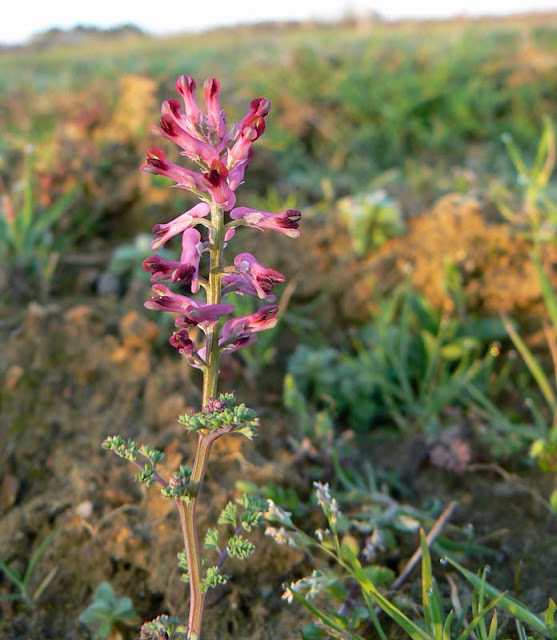 So maybe corydalis is it. I found a few of these out in a small field at the end of the vineyard road. We often see wild orchids out there a little later in the season. I always worry about taking pictures like this because I can't see the screen on the camera unless I lie down in the wet grass, which I didn't do. So I take a few photos trying to point as best I can and hold the camera still at the same time. As I'm not the most physically coordinated person around, I think I got lucky this time. 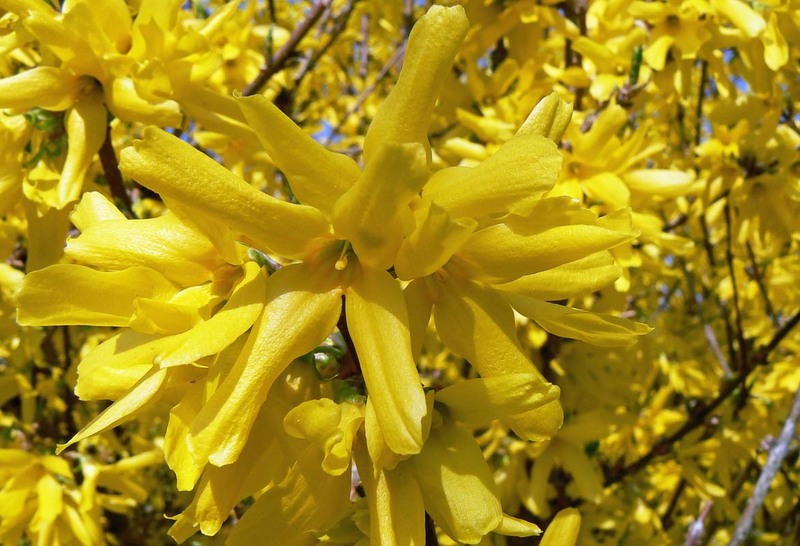 Or, in French, forsythia. Yup. Same word. Just a slightly different pronunciation [for-seece-YAH]. The French don't have our th sound in their language. Now is the forsythia's flowering season. We have two bushes in our garden. One is larger than the other; the smaller one seems to be dying. A friend noticed a fungus growing on the lower stems last year. And in the past couple of years it hasn't bloomed as profusely as it's larger brother. 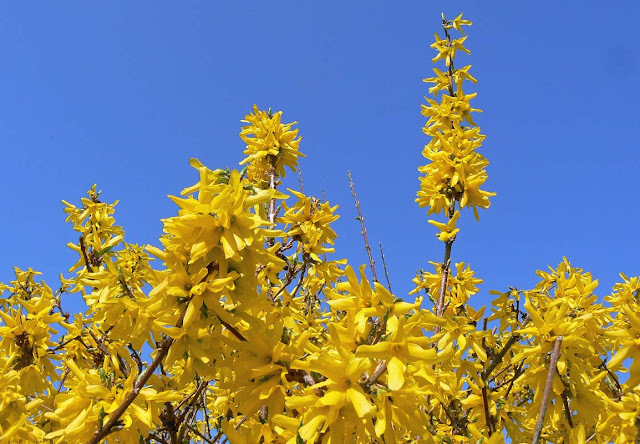 I love the contrast between the bright yellow flowers and the blue sky. I'm sad to say that we're probably going to take it out sometime this year. Oh well. It will be an opportunity to put something new in. What I don't know is if I'll have to worry about that fungus remaining in the ground and attacking whatever we put in. I'll have to do some research. A close up. Both of these photos are from the healthy tree. Our month of March is going out like a lamb. Sunny, pleasant, and dry days have been the characteristics of the last week or so. We've been working in the garden, sitting out in the sun, and yesterday we got the grill out for hamburgers (turkey burgers, actually). We're expecting a little cool down over the weekend, but there's no significant precipitation in sight. The news is full of stories of the deepening drought. 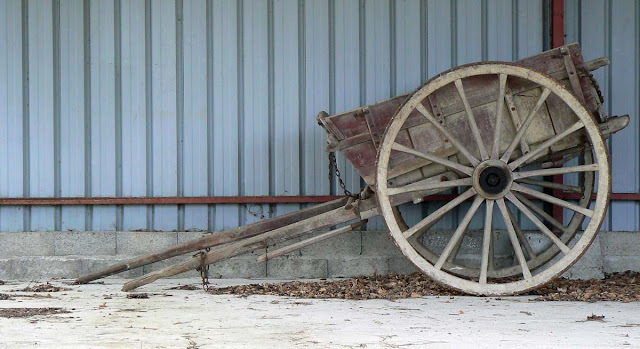 This old horse cart has been stored in this hangar down below our house ever since we've lived here. I don't know who it belongs to or if it's ever used. There was a second one along side for a while, but it disappeared a couple of years ago. There were also some barrels and other things in the shed that were cleaned out. 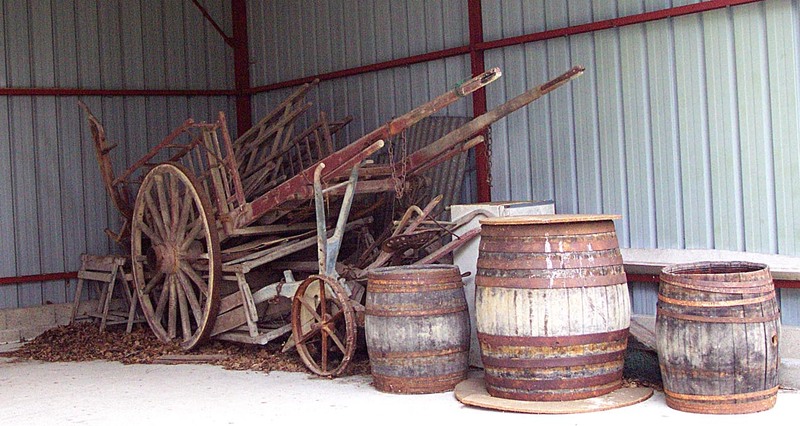 An old horse cart sits in a modern shed. Ken posted a picture of the way it used to look on his blog earlier this week. I took this picture just a few days ago. Callie and I walk by this shed just about every other day this time of year. Remember Hyacinth Bucket? From "Keeping Up Appearances?" She was forever saying her name was not pronounced "bucket" but "bouquet." I always think of her character when my own hyacinths come up in the spring. Here's a close-up of some of our jacinthes (hyacinths) out in the back yard. 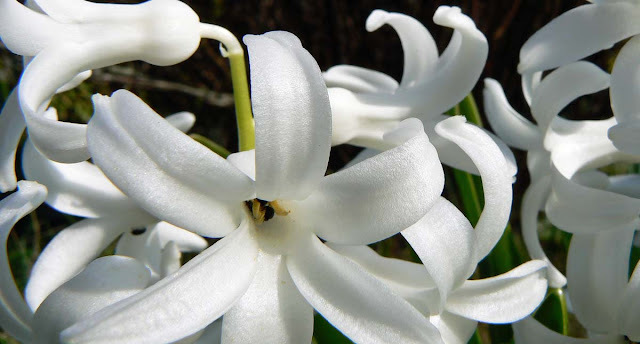 I ripped up these bulbs and replanted them a number of years ago. I planted them in a straight line and I shouldn't have. They would have looked better in a bunch. Live and learn. But they're still flowering and looking good. Yesterday I got the mole hills done, like I wanted. I also got some trimming and cleaning up done. The rhubarb is growing nicely and I'm trying to keep it watered. I sure hope we don't have a freeze. It could happen. After all, it's still only March. And, for the record, I do not have a Mercedes, a swimming pool, or room for a pony. At first I thought these were some of the blackberries that grow wild along the edges of the woods and the vineyards; they are starting to blossom now. In February, I took pictures of those brambles covered in snow. But on closer inspection of these photos, I don't see any thorns. When I took pictures of these with snow in February, they were definitely covered in thorns. Blossoms on the verge of opening. Notice the definite lack of thorns. Now I'm not at all sure what these are. I know where I took the pictures, so I'll have to go back out there to check it out. I know there are blackberries out there, and I don't think there are any other fruit trees, so I'm kind of stumped for the moment. 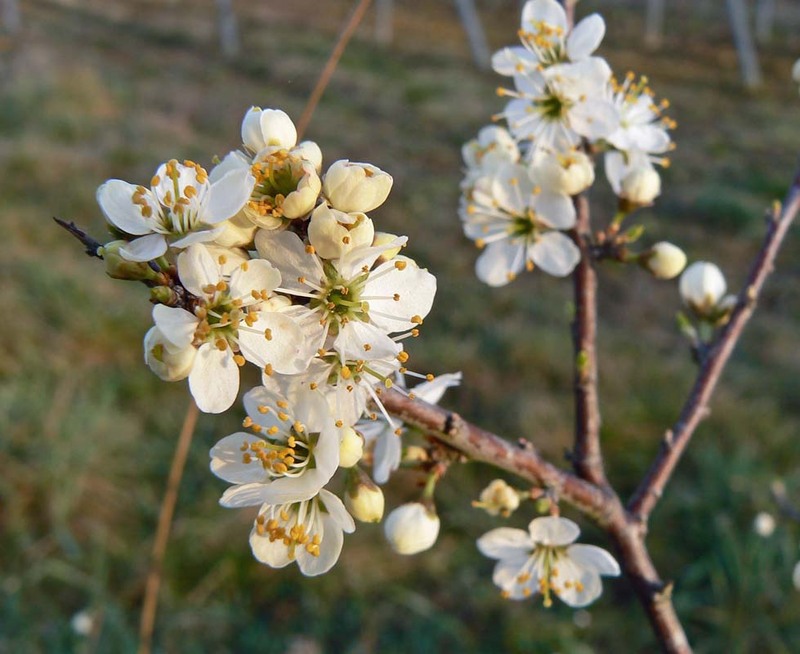 UPDATE: I think my first two commenters have nailed it: these are prunelles (sloe berries). Thanks MilkJam and Susan! These blossoms had already opened. 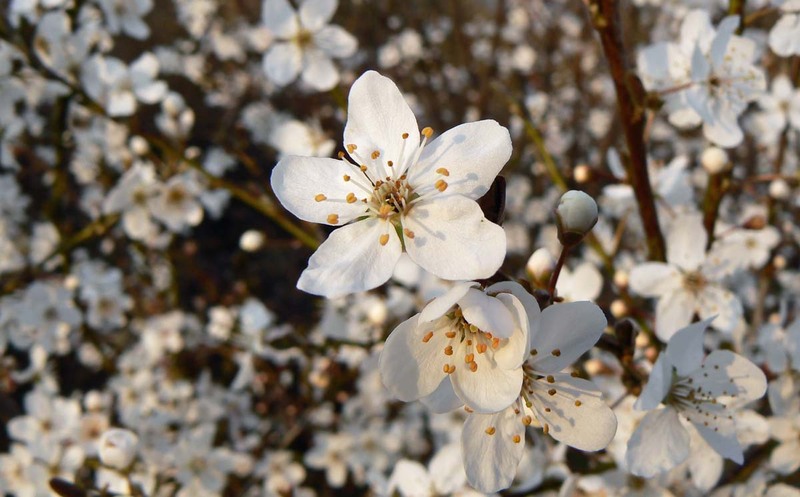 They look like plum blossoms, but smaller. Today I'm planning on tackling the mole hills in the back yard. I want to move some of the dirt from the hills to a few places here and there that need some filling, like where I removed a bunch of iris bulbs. Otherwise, the dirt will just get spread into the grass. It won't be long before I'll need to get the lawnmower out and start cutting. 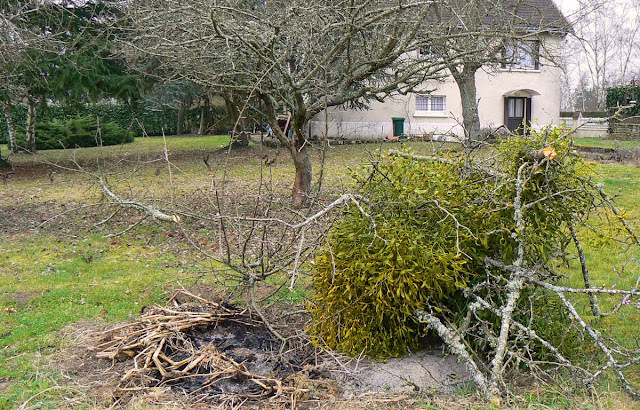 Of course, I have a bunch of branches to cut up (from pruning the apple trees) before I can start that. There's still time. The willows are flowering now and the big weeping willows in our neighborhood are covered in light green. 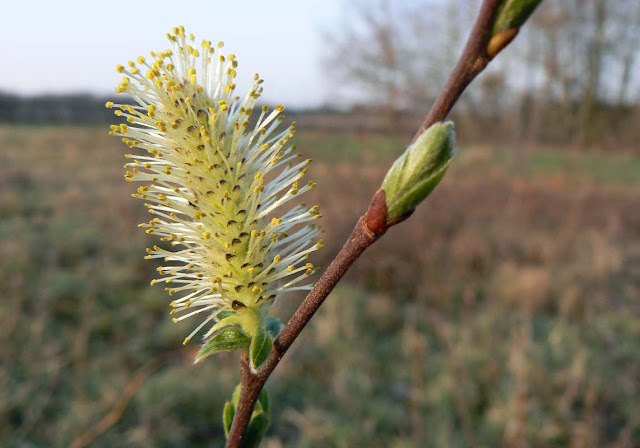 I found this flower on a sapling in a field. I'm not sure what variety of saule (willow) this is, but I do believe it's part of the family. Please let me know if I'm mistaken. Saule rhymes with "soul" and a weeping willow is called a saule pleureur. As you can see, we've moved our clocks to Central European Summer Time (CEST). It feels like we've now adjusted the time to our body clocks. For the past week or so we've been waking up earlier, wanting lunch earlier, and have been ready for sleep earlier than normal. It's the lengthening days that make us want to wake up with the sun instead of the clock. Now that we've moved forward an hour, the time feels like it ought to. 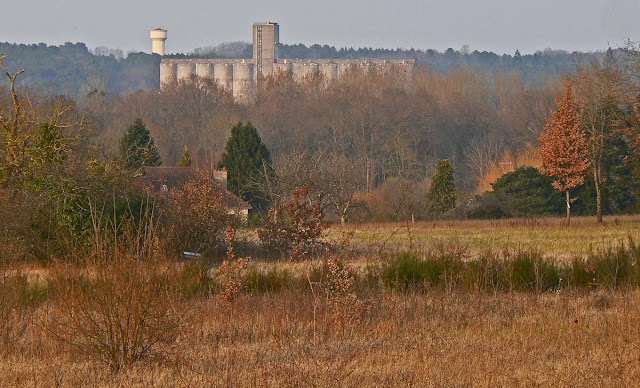 Some of you will recognize the grain silo that sits down across the river from our house. It's an active storage silo that's located along side the railroad line that parallels the river. I assume that the corn, wheat, barley, colza, and sunflowers that are grown all around us pass through this facility at harvest time before it gets loaded into rail cars to go to mills and processing facilities elsewhere. It won't be long before all this brown and gold turns to green. When the weather is clear, like this, you can see some of the details on the building. When it's rainy or misty or foggy, the silo can look like a huge cathedral in the valley. I made a loaf of bread for sandwiches on Wednesday using that recipe for hot dog buns that I made last week. It worked great. Not that we can't get sandwich bread; the supermarkets all sell a lot of it and the bakeries will slice their larger loaves whenever you ask (they have these great machines that saw each loaf into perfect, uniform slices). 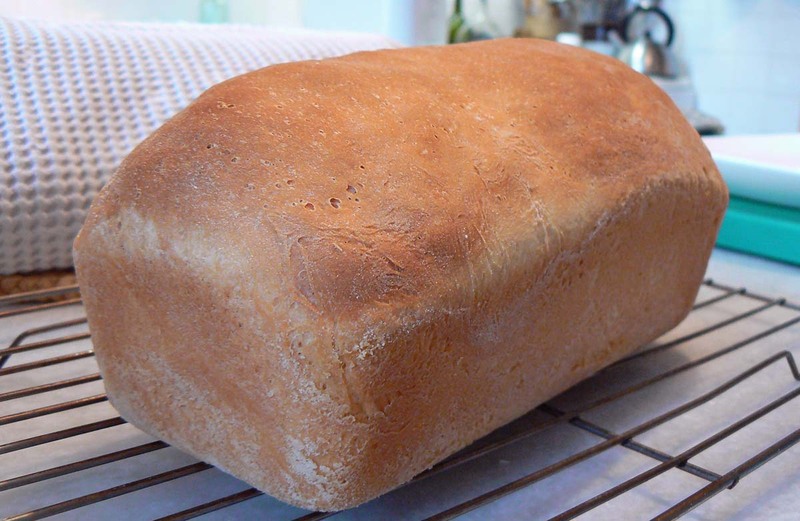 My loaf of sandwich bread, cooling on a rack. We used this loaf for tuna salad sandwiches served with french fries and some broccoli. The leftover bread was great for toast on Thursday. 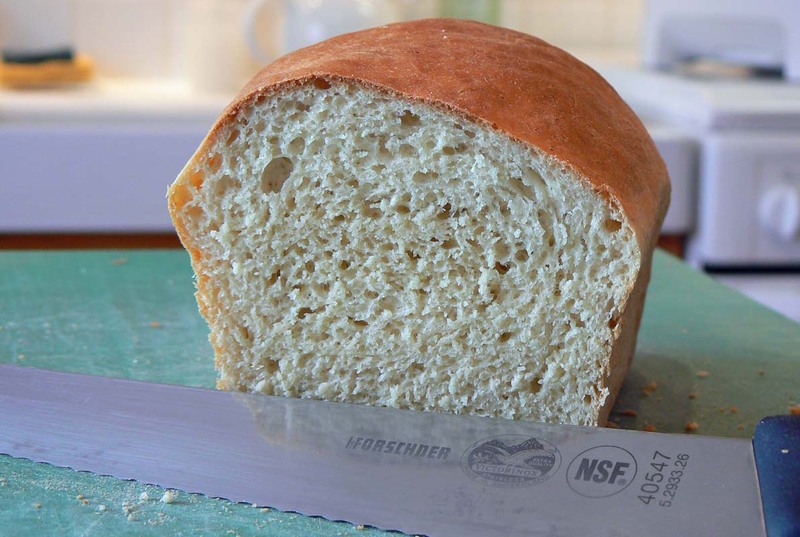 I won't be making a lot of bread, since we normally eat French bread with our meals, but it's nice to have an easy recipe to make sandwich slices once in a while. And as we know, it's perfect for hot dog or hamburger buns. Here's what it looks like inside. Watch out, Wonder Bread! Which reminds me, I should be dusting off the bbq grill soon so we can make some hamburgers! Down the hill to the north of the house is a hiking trail called une randonnée. These are marked trails that wind their way all around France. There is a network of grandes randonnées (long-distance national trails) that intersect with many petites randonnées (smaller networks of local trails). The one near us a part of Grande Randonnée 41, which goes from the city of Tours down to the Le Mont-Dore in the Puy-de-Dôme. That's a long trail! A little well-tended orchard of about twenty trees, apples and plums, I think. 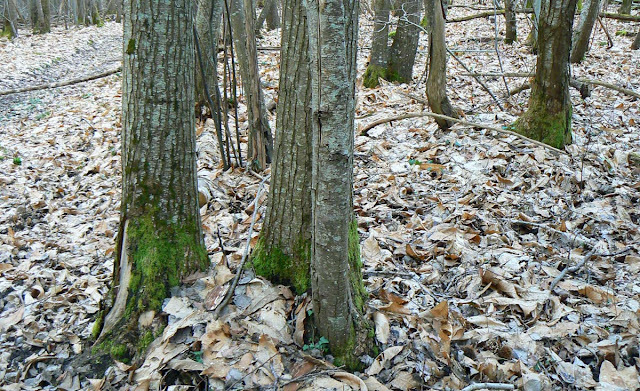 The trails are usually pretty well maintained and are well marked so that hikers can follow them easily. We've walked a tiny part of the trail from where it crosses our road into Saint-Aignan and also in the other direction to Mareuil-sur-Cher, each walk about two and a half kilometers (one way), but that's as far as we've gone. When we get to the bottom of the hill we can either turn right, which Callie and I normally do, and follow the trail for a while in one direction, or turn left, which Callie and Ken often do, and follow the trail in the other. Callie waits for me at the bottom of the hill to see which way I'm going to turn. She almost always wants to go left but, like I said, I normally go right. The other day I went left. Callie was happy. There's a little orchard along the way on the left-branch of the trail. 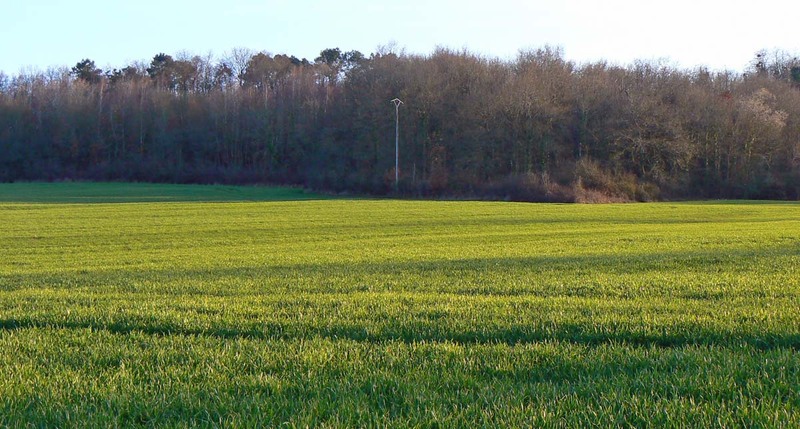 It's a small plot of land on the edge of a field and whoever owns it tends it well. He plows the ground around the trees to keep the weeds down. I've seen him pruning the trees a time or two. And I've seen him out picking fruit. 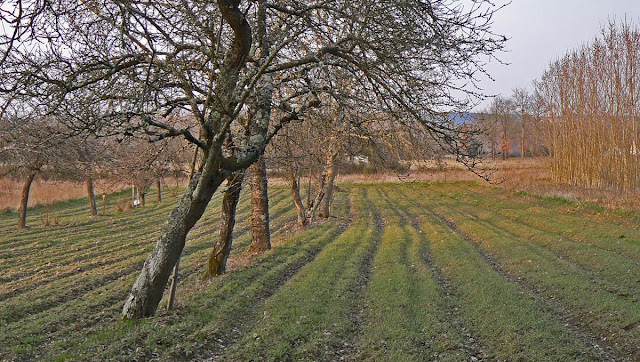 There are several little orchards like this one around where we live. I don't know if they're owned by the same guy or other people. I like that they exist on the edges of the woods; the natural and the tended thrive side by side. I know that Ken already posted a picture of these, but they're so beautiful that I couldn't resist. I see a lot of these trees around our neighborhood (this one's in our yard) and they're all flowering now. 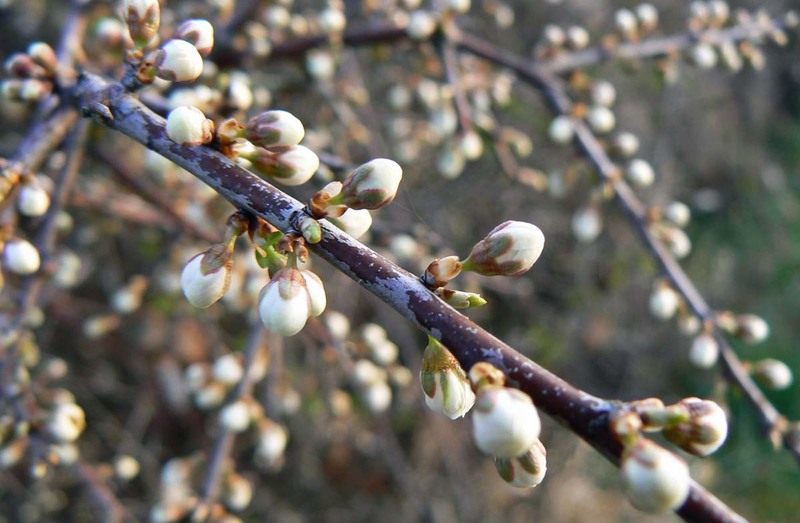 Other trees are starting to flower as well; another good warm spell and spring will be busting out all over. I wonder how many plums we'll get? This tree is still very small. Our daffodils and hyacinths are up and flowering, too. In another few weeks we should start seeing apple blossoms. There's still a lot of clean up to do out back. We got a bunch done when it was warm last week, but the chilly relapse has kept us in for a few days. We'll be back at it before long. We are at now past the point of the astronomical vernal equinox. Of course, true to form, this morning's temperature is very close to zero and there are frosty patches outdoors. But they won't last long. The sun will be spending close to twelve hours with us today. No wild turkeys here, just the occasional pheasant, hawk, or crow. This is one of those photos that doesn't do reality justice. Those gossamer web-like strands you see are wires strung across the tops of the vineyard posts. They act as supports for the grape vines as they grow. In the right light, at the right time of day, they can look like webs glinting in the sun. We watched the weirdest show on television last night. It was about a guy in Florida who hatched a clutch of abandoned wild turkey eggs and raised the chicks as if he were their mother. He spent every waking minute with the chicks as they grew over their first year, clucking with them (he claimed that he learned the variations in their vocalizations and that they were actually communicating), running with them in the woods, and at one point he even ate a grasshopper with them. It was very strange. Spending time with turkeys. Well, looking back on some of the jobs I've had, maybe it's not so strange a concept after all. Want to see my buns? Hot dog buns. What were you thinking? Ken had a yen for hot dogs and we decided to make home-made buns for them. So our Sunday lunch menu was hot dogs, French fries, and green salad. It was amazingly good. Sunday's lunch: hot dogs on home-made buns with French fries. Yum. Ken found a bun recipe on the web and I gave it a try. I needed to add more flour as the dough I got by following the recipe was a bit too wet. I also had to let the buns rise longer than the recipe said. 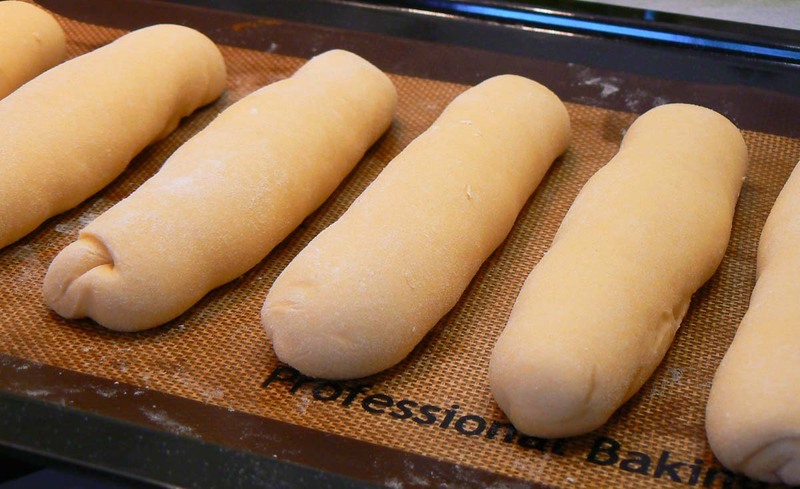 I wasn't surprised at that because I'm familiar with bread dough and knew that twenty minutes wasn't long enough. My dough rose for an hour and a half. The buns after they'd risen, ready to go into the oven. The buns baked up beautifully. When they came out of the oven I covered them with a towel to let them cool slowly. That helped to make them soft and without a hard exterior crust. They were absolutely delicious. Perfect to hold our hot dogs. The difference between the buns and French bread is that the buns are made with milk and eggs which, I assume, makes them soft, almost cake-like. 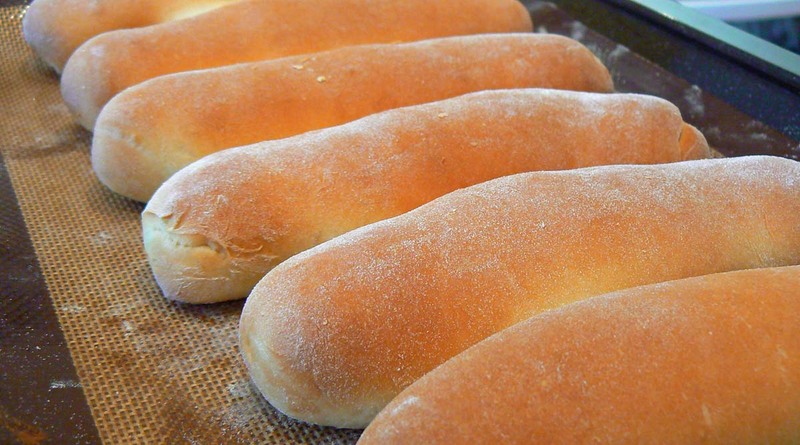 The finished hot-dog buns, fresh from the oven. 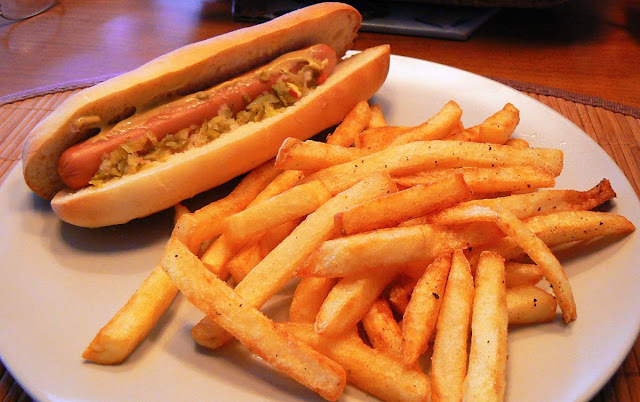 Ken made some pickle relish and we ate our dogs with that and some Dijon mustard. We also had ketchup and mayonnaise on the table. Another wonderful lunch success. 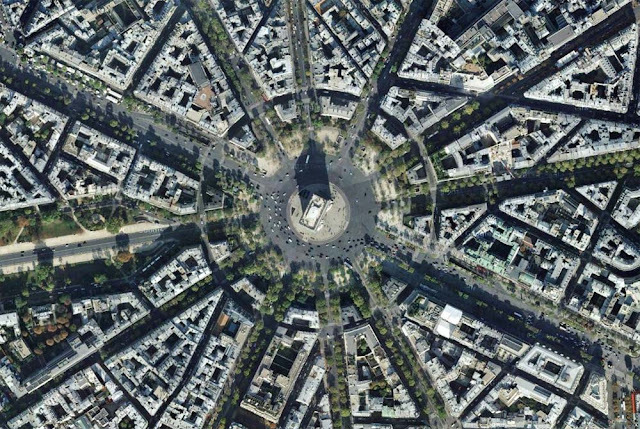 If you've traveled in France, you will have noticed that ronds-points or carrefours giratoires (traffic circles) are everywhere. 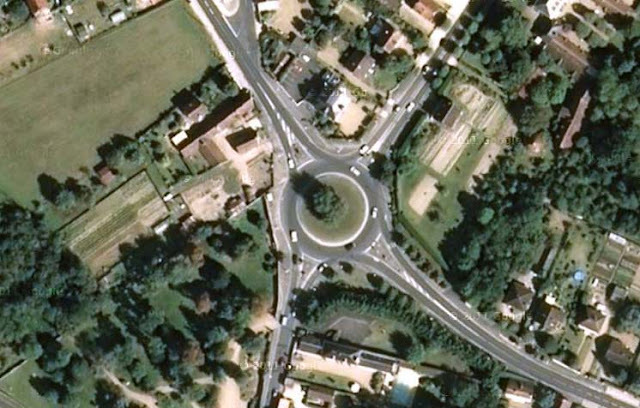 For the past thirty or so years, France has been converting intersections into traffic circles to improve traffic flow and safety. Circles slow traffic down, but keep it moving, and they eliminate nasty crashes due to drivers running red lights or stop signs. A circle in Noyers-sur-Cher, across the river from where I live. Notice the lack of pavement markings. This is a two-lane circle and one that I use frequently. 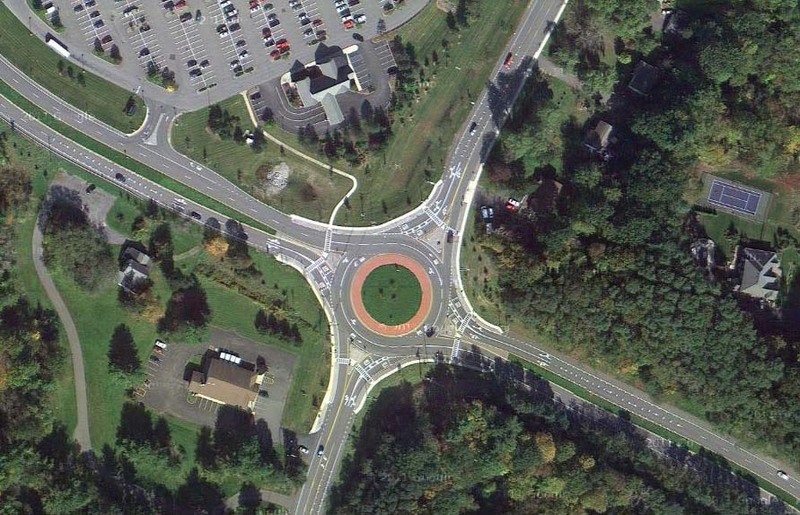 Some of the communities around my home town in upstate New York have been putting in traffic circles in recent years. I've read that they're met with howls; American drivers are not used to them and tend to panic. But the data I've seen on them show that, while minor accidents increase in the period just after the circle is built, the severity of accidents drops dramatically. As people become used to the circles the minor accidents decrease as well. A similar sized circle outside of Albany, NY, USA. See all those lines and words and arrows painted on the street surface? No wonder people panic. When I first navigated these new circles in the US, I was struck by the overkill of signage and pavement markings around them. Here in France, there is normally one sign to tell you that you are approaching a circle and that you must yield in addition to the standard directional signs. There are very few pavement markings. Navigating the circles here is just matter-of-fact. Nobody panics. You enter the circle when it's clear (you don't have to stop) and when you're in the circle, you have the right of way. And you signal when you're exiting the circle. With the lack of signage and pavement markings, you can pay more attention to other vehicles moving in and out of the circle. This little circle in Paris can be a bit challenging. Still, notice the lack of pavement markings! Mind you, I'm talking about circles outside of major urban areas. Suburban circles can clog with high volumes of traffic and big city circles, or places, are a different animal altogether (although not as much as you might think). I think traffic circles are a vast improvement over signalized intersections. First of all, there's no set of traffic signals to maintain. And to me there's nothing more frustrating that idling at a red light when there is no other traffic in the intersection or having to sit through over-engineered multiple turning phases waiting for my green arrow. The fact that all traffic has to slow down to enter and navigate the circle makes me feel a whole lot safer, too. 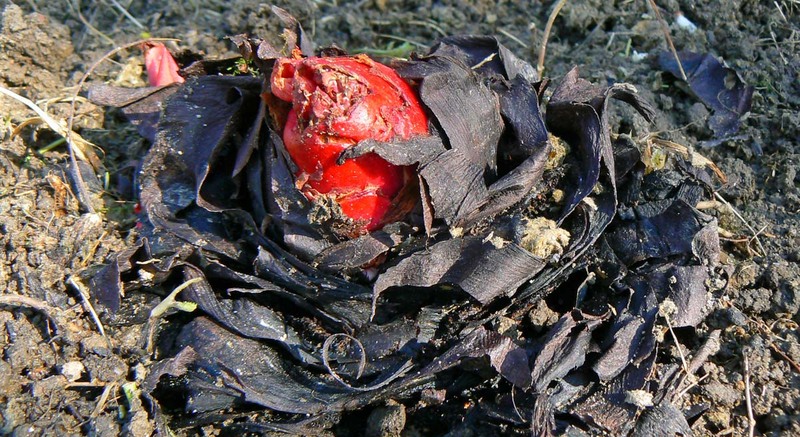 Rhubarb, that is. The rhubarb patch in our garden had gotten all grown over with weeds so I thought I'd fix that this year. The first thing I did was to apply a bit of roundup (not very ecologically correct, but efficient) on the weeds before the rhubarb sprouted. That was about a week or so ago. The weeds obligingly died. New rhubarb sprouts poking up through the soil. Yesterday I went out and pulled up the dead and dying weeds to find the rhubarb actually starting to sprout. This will be the first year in many that the rhubarb will have a weed-free patch to grow in. I'm hoping for a good crop. We had a decent crop last year because we watered the patch more than usual. So I'll try to keep it well watered again this year. Stay tuned. I told you about the drains. I had to clean them out. We have two regards in the utility room floor, which I suppose are called "access points" in English. 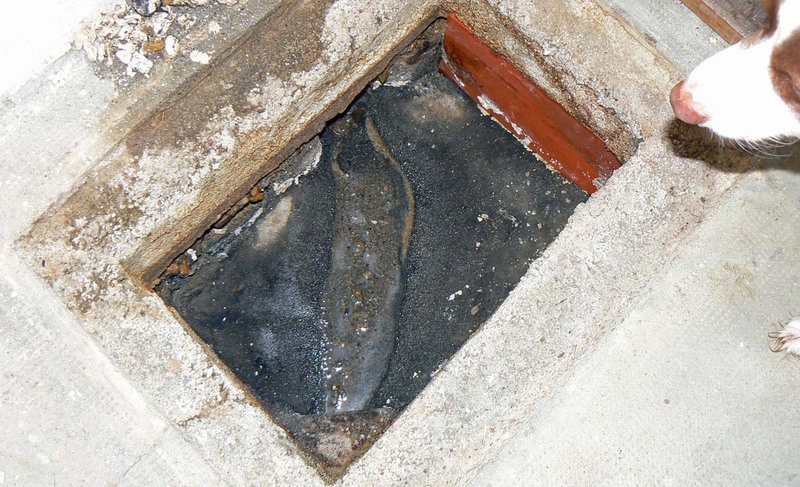 They are large concrete basins between the pipe sections where the drain water slows down and drops sediments. Callie thought the smell was interesting. So they have to be cleaned out periodically and while it's a yucky job, it's pretty easy to do. However, over the years, the pipes themselves accumulate gunk between the regards. So how does one clean them out? Manually, of course, with a pipe snake. This is one of the regards with the cover removed. Callie is enjoying the smell. We invested in a power washer and an attachment that snakes out drains. I used the attachment to clean out our pipes. 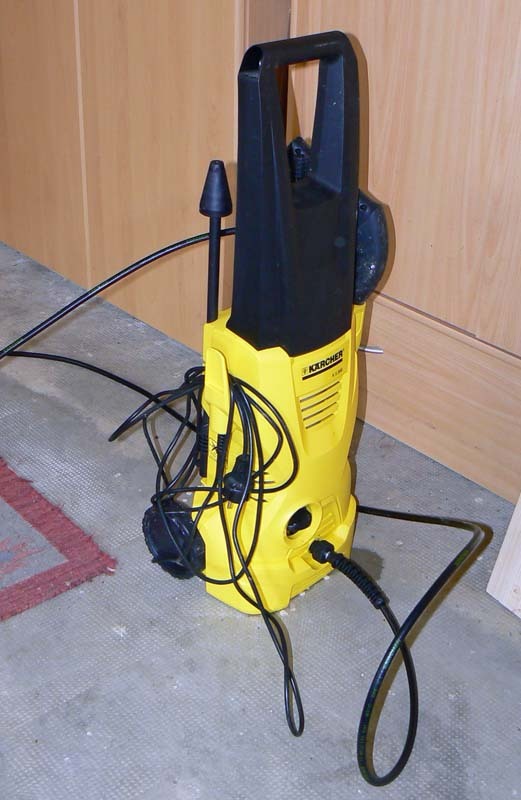 Unfortunately, I needed to alternate between the manual snake and the power washer snake. Neither one could clear the blockages alone, but alternating them seemed to work out. So that's what I did. The other regard. The main pipes are on the bottom; the plastic pipes you see come from the utility sink and the downstairs shower. It took me several hours of working the manual snake through the concrete pipes and then doing the same with the power washer snake to actually dislodge the stone-like build-up inside them. But it eventually broke up and came out. Now the drains are flowing well. 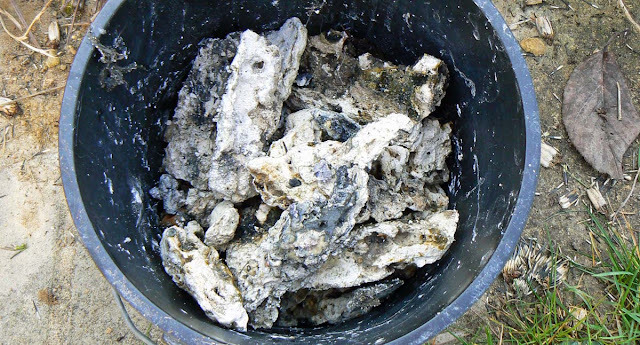 This is the calcium gunk that came out of one section of pipe. Yuck. 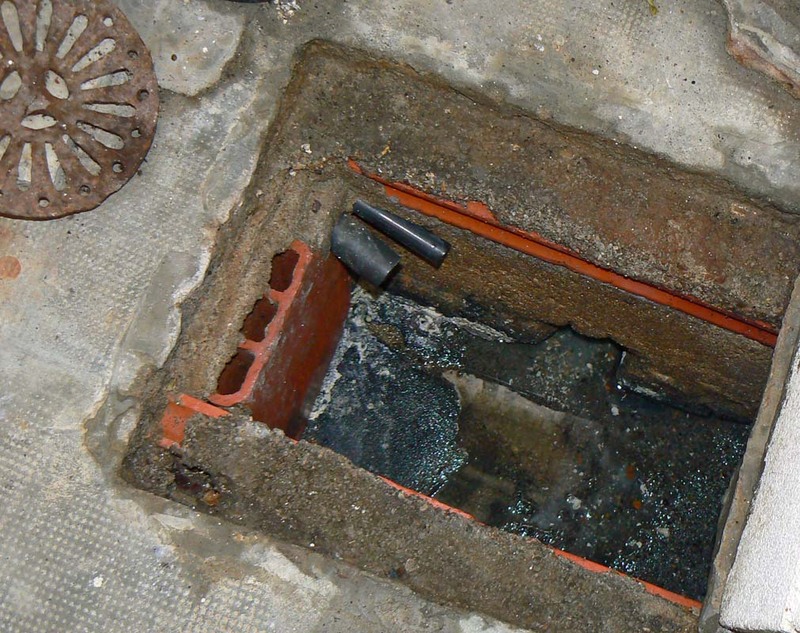 I think that there were decades worth of build-up in those drains. I'm happy now that they're flowing more freely. I think the power washer just paid for itself. Just down the hill from our house, through the woods, there's a big field that is cultivated every year. Last year it was filled with colza (rapeseed). When that was all plowed under last fall, the farmer planted a winter crop of some kind of grass. I saw him last week out there spreading fertilizer pellets with his tractor. The winter crop looks lush and green right now. I wonder if this grass is actually some kind of grain that will take off now that it's spring, or if there's another crop planned. I've seen wheat and/or barley in this field in certain years. I don't remember ever seeing corn or sunflowers here, however. Once the grapes start growing I won't get down there much. The vineyard is separated from the woods where the path is by an electric fence. When there's danger of the deer eating the grape flowers (in spring), the fence is activated and Callie and I steer clear. 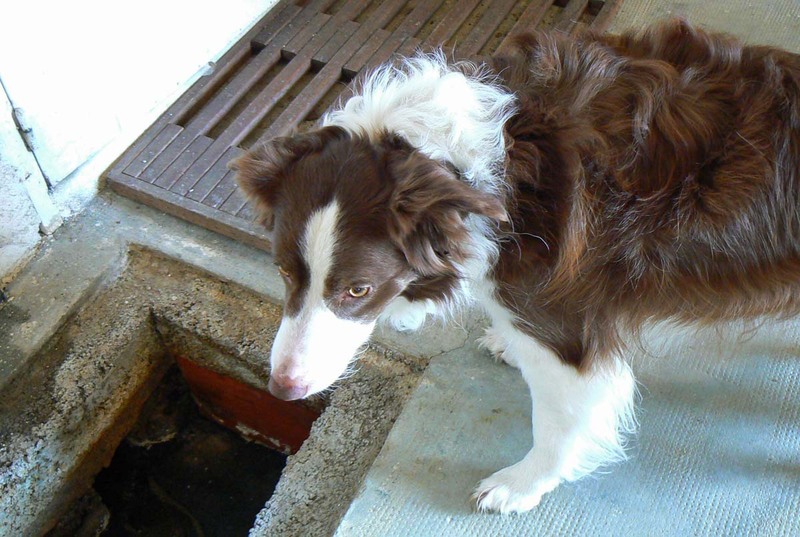 I made good progress on cleaning the drains. That's a job well done. Now I need to get back outside and do some more tree trimming. Thankfully, the weather is good. These are starting to pop up all over. 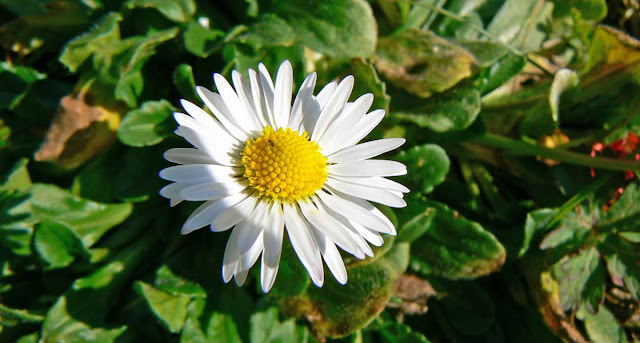 They're tiny little daisies and they're a fixture from spring all the way through summer. They're small enough that most of them are below the lawnmower's blade. These are called pâquerettes in French. I started working on cleaning out some of our drains yesterday. The gray water from our house drains down to the sewer system (which we got hooked up to in 2007) through three lengths of concrete pipe laid under the slab of the house. Those pipes get pretty gunked up, mainly with calcium deposits mixed with grease. Yuck. I've been using a combination of a manual snake and a pressure washer snake to clear the pipes. It's not easy because they're "this far" from being totally blocked. I spent about two hours working on two sections of pipe on Tuesday. One section is completely cleaned out now. The other needs more work. Then there is a third. Wish me luck. The good news is that I'm cheaper than a plumber. Monday was a beautiful day, and the rest of the week is supposed to be even better. Callie and I took some time to hang out in the sun, playing ball and snoozing. I actually got some color in my face. Callie did some hunting for lizards. They scurry along the walkway border and she likes to chase them. I know I heard a lizard in there. I know it. I took advantage of the nice weather to get our outdoor chairs cleaned up for the season. Today I have a few outside chores I want to tackle. We'll see how far I get. And mistletoe. No, it's not Christmas. 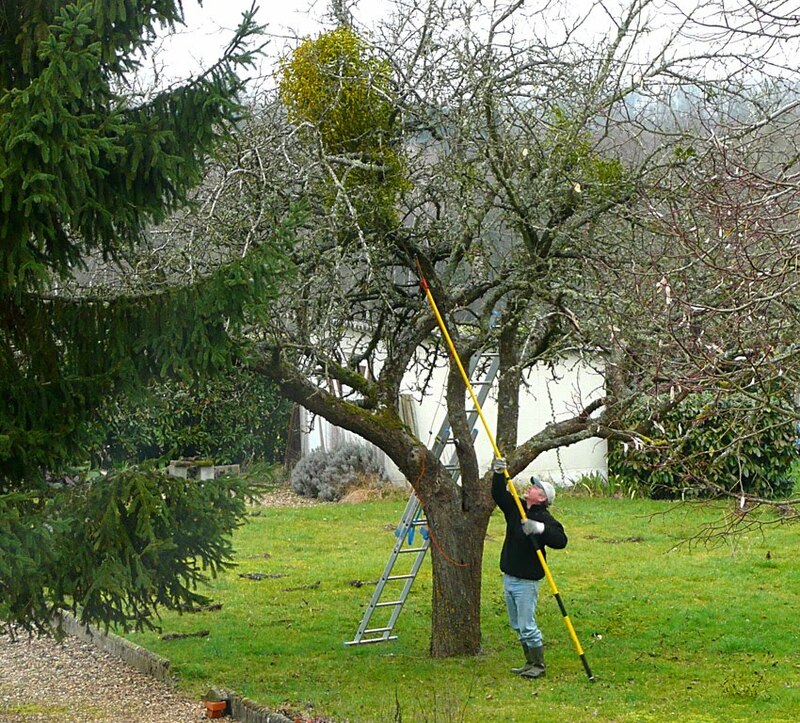 Just our big apple tree that is was full of mistletoe. Huge balls of mistletoe. You can see what they looked like here (Ken's picture from Sunday). I think this tree's days are numbered. 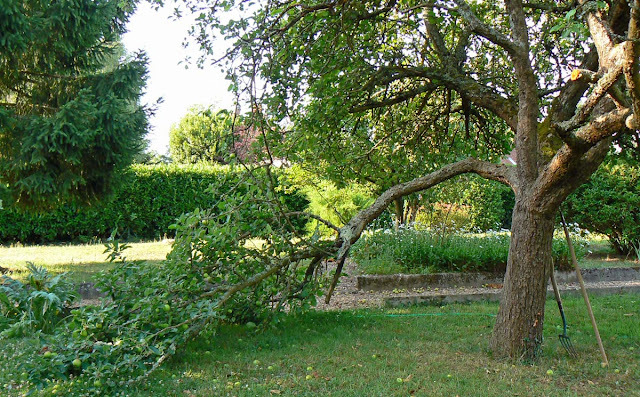 Last summer a sizable lower branch came down in a wind. The branch was at least foot thick, but it was hollow. I seen signs of other weaknesses in the tree, too. 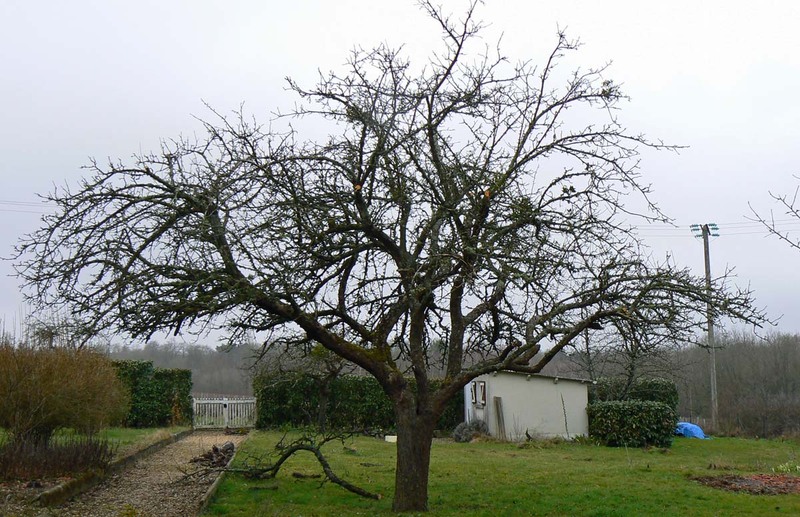 The big apple tree with the worst of the mistletoe pruned out. It looks much better. For one thing, the mistletoe is growing on nearly every branch. So I decided to perform some tree surgery and remove the branches with the worst growth. That thinned out the tree pretty nicely which, I'm hoping, will also reduce the apple crop in the fall. We get so many apples from this tree that they have to be picked up several times each season and composted. Big balls of mistletoe cling to the cut-out branches. The tree just behind this pile is another, smaller, apple. Cleaning this up required the chainsaw. A curious thing happens during the grape vine pruning season out behind our house. The parcels are owned by several different growers. 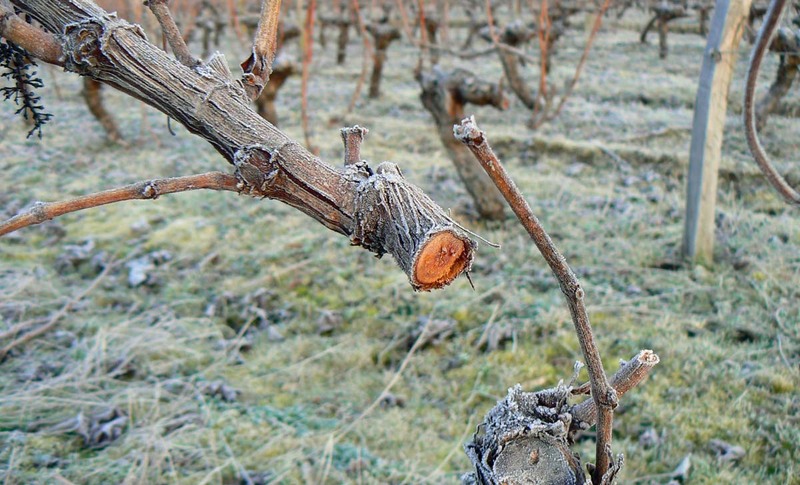 Many of the growers are out there themselves pruning their vines. A couple of them burn the trimmings in barrels as they go. The others line the trimmings neatly between the rows and then come by later with a mulcher attached to a tractor and grind them up. A pruned grape vine covered in frost. The grower with the largest parcels has employees who do the pruning. In some parcels, they line the trimmings up between the rows, and he drives his tractor over them in late spring to grind them. But in other parcels, the pruners simply clip the vines and leave the trimmings hanging there. Later, itinerant workers go through and pull the trimmings off the rows and line them up for grinding. This photo is from one of those parcels where the vines are trimmed and left hanging. These are the new lettuce sprouts. There's romaine and escarole. My plan is to keep one of each of the two plants per container. When they're big enough, I'll plant them outdoors under a cold frame (in case of frost). I'm hopeful that we'll have lettuce to eat in May. One of two trays of little lettuce sprouts. After these get planted, I'll put some more seeds in these containers to get a second crop going. Let's hope that we don't have any more hard freezes! Winter peeked back at us on its way out this week. At least, we hope it's on its way out. We had a few frosty mornings, but the daytime temperatures have been mild. Not warm; we're still building the daily fire. Just not cold. 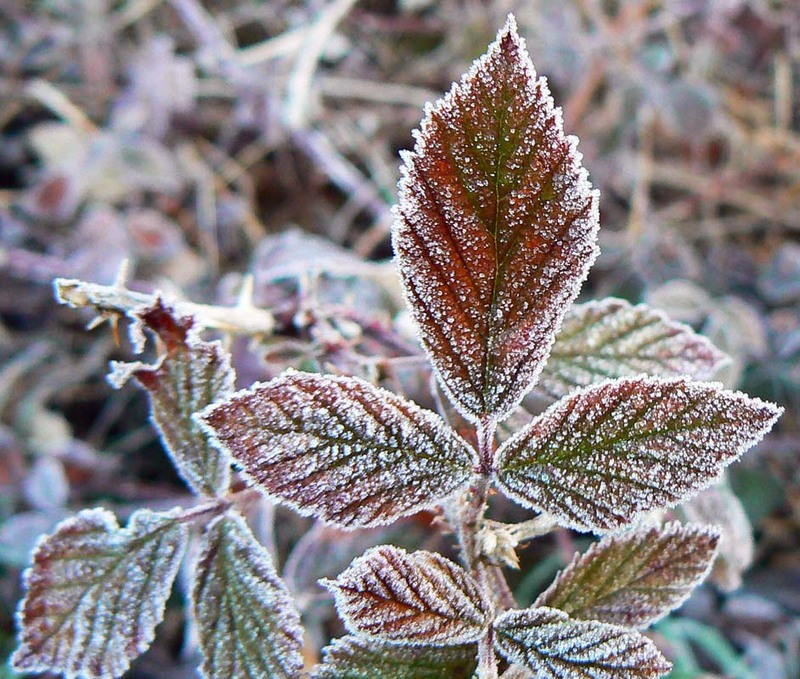 The frosted leaves of a wild blackberry vine. I took the camera out to try to get some more shots of the frost. Most of my pictures don't come out well because I'm not using the tripod in low-light conditions. And I'm not taking the time to to make manual photos (which might help). I'm just doing quick point-and-shoot photography because it's cold and I'm walking with the dog. Still, a few of the photos work well enough to share. Wednesday morning gave us frost. The sky was clear and there was no wind, so it didn't really feel cold. 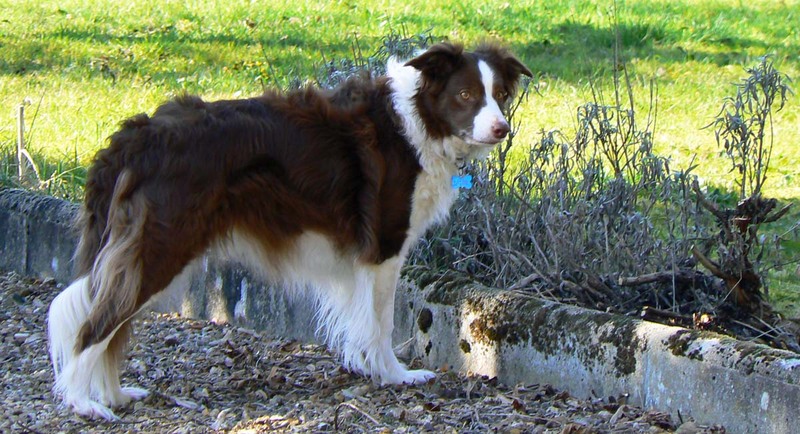 Callie and I wandered the deer paths that wind between the parcels of grape vines and around the patches of woods. I would guess that about fifty percent of the parcels out back have been pruned. Looking roughly northeast across the river valley. Just beyond the tree-line in this photo, the land drops down into the river valley. If you enlarge the picture (by clicking on it), you might see the opposite bank, just beyond the layer of fog that's sitting down on the river itself. The growers and vineyard workers are out there nearly every day, making slow but steady progress. I'm hearing more birds each day, and I'm noticing that the trees are budding out. I've made this recipe many times and have probably even blogged about it before. Well, here we go again! I made this one on Monday as Ken's birthday dessert. 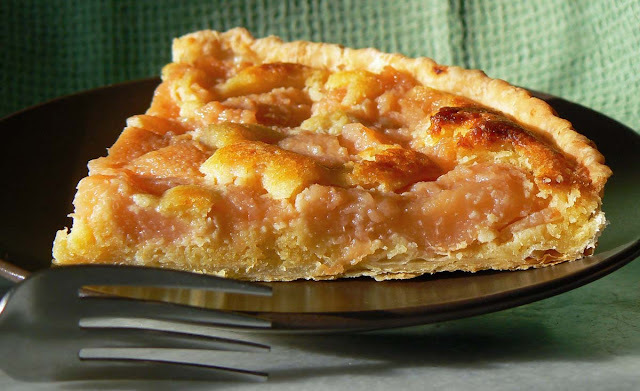 He loves almond and pears and this tarte is one of his favorites. Cream the softened butter and the sugar together. Add the eggs (beaten), then the almond powder and the flour and beat until well mixed. Add in the liqueur. Blind bake the crust then, when cool, pour in the batter mixture. It will be thick, so spread it out to fill the crust. Press the drained pear pieces into the batter as far as you can without breaking them. Bake in a moderate oven (180ºC or 350ºF) for about 30 minutes. I really have to get out with the camera again soon. The last two times I was out with Callie it was either raining or cold and windy and I didn't feel like taking the camera. Until I do, you are stuck with pictures of trees in the woods. Moss covers the bases of these tree trunks, and yes, it's on the north side. Ken's birthday dinner was good, if not a little scary. We planned to have a fondue bourguignonne, which is cubes of tender beef cooked in hot oil at the table. We had run out of sterno, the heating fuel, the last time we made a fondue. No problem, I thought, I'll just get some of the French kind that I see in the supermarket. It burned very well. Too well. The flames were reaching up around the sides of the pot and the oil was bubbling and boiling and we were afraid for our lives at one point. Then I couldn't get the flame to go out so I blew on it and, while the flame did go out, I blew the fuel all over the table. What a mess! Still, the beef was delicious. We ate it with sauces: a blue-cheese cream dressing, a horseradish cream dressing, worcestershire sauce, ketchup, and smoky chipotle tabasco. We also had a macaroni salad and broccoli along side. For dessert, I made an amandine tarte with pears from our tree that Ken had put up last fall. All in all a good day. We managed not to burn the house down. It's not a "milestone" birthday. But pretty much every birthday is a milestone after a certain age, isn't it? I'm not saying what that age might be. This year marks the thirty-first time we've celebrated his birthday together. The birthday boy on the left, me on the right. 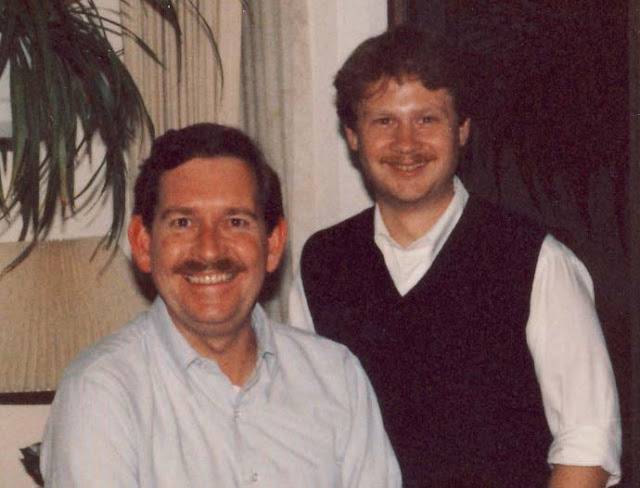 Here we are twenty-six years ago, right after we moved to San Francisco from Washington, DC. He hasn't changed a bit. These tire tracks, made in the mud after our big snow and subsequent thaw, got re-frozen shortly afterward when the overnight temperatures started going down below zero again. It hasn't frozen again for over a week, so the tracks are getting smoothed out again. 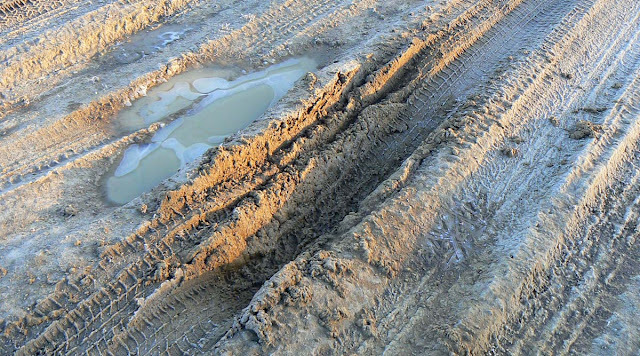 Frozen puddles and tire tracks in the vineyard road. We had a good market day yesterday and, except for not finding snails, we got a few sausages (spicy lamb merguez and pork Toulouses) and a good cut of beef for making a fondue bourguignonne on Monday. That will be for Ken's birthday dinner. We also stopped at a garden center from some soil. 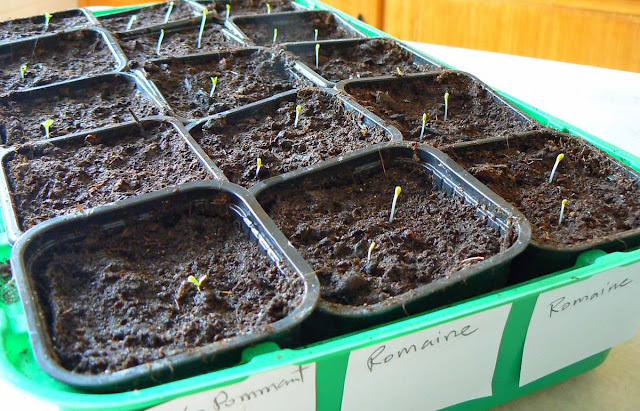 I will be starting lettuce seeds inside today so that we can put them out in the garden in a few weeks, either under a cold frame or some other protective contraption in case it freezes again. I'll also plant some radishes at that point. Finally, we stopped at a hardware store to check out sharpening machines. I have several blades that need sharpening and paying someone to do them every year can really add up. I checked out tourets à meuler (power sharpening wheels) on the internet and saw some interesting deals. Our local hardware store just happened to have one on sale (almost half price) and we couldn't resist. Now I'm going to have to install it in the garage and try my hand at sharpening my own blades. First up is the axe (for splitting logs), then the chipper blade followed by the lawnmower blade. We also have a few old knives and a Chinese meat cleaver that we might try to sharpen up. If I can manage it with good results, the machine will pay for itself in two or three seasons. I'll probably put up a picture once I get it out of the box. We're not having any morning frost right now, but I've still got some frosty photos from a couple of weeks ago to share. Here's one of the vineyard stakes, pulled up and discarded on the ground, frosted over. These old vineyard stakes will likely be collected and used as firewood. You can see the ice crystals on the log; they look like little white hairs. Most amazing. Thankfully, it's warmer than this right now. We've got mostly fog and drizzle. But one of these days the sun will come back out and warm us up even more. French food, at its base, is very simple. Good ingredients, simply prepared. Fancy stuff abounds, as in any culture and any cuisine, but the basics, the standards, are the foundations upon which haute cuisine is built. The French use a phrase all the time, la cuisine de grand-mère (grandma's cookin'), that encompasses most of the standard home recipes and techniques of French food. And since that is the kind of food that Ken and I prepare and eat most often, I thought I'd start a little series to showcase it. The first thing you need to make carottes rapées is a good bunch of carrots. The first time I came to France (1981) I was, as many people are, amazed by the food I saw in the windows of Parisian bakeries, delis, butcher shops, and at street markets. Everything looked so appetizing and delicious, whatever it was. It wasn't long (even on my meager student budget) before I was a regular consumer of prepared salads from the charcuterie. 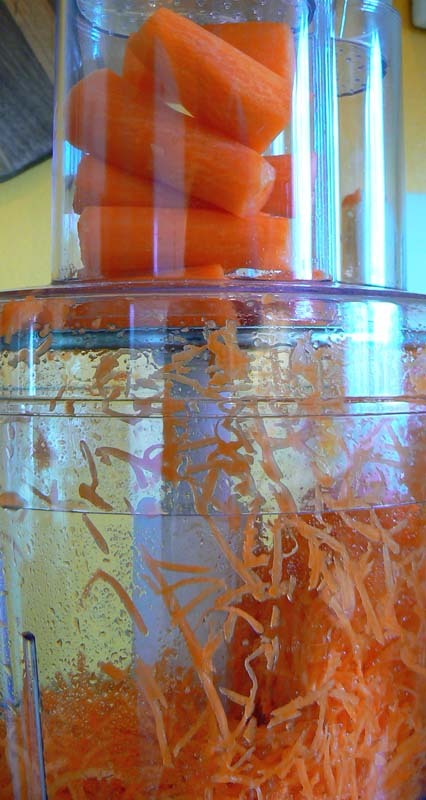 Peel the carrots, trim off the ends, and cut into lengths that will fit your food processor. 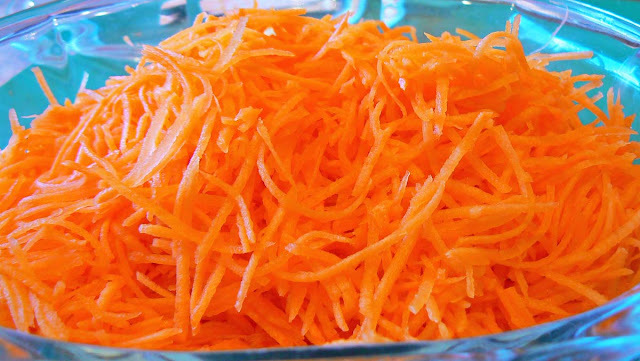 Among my favorite salads is carottes rapées, made from grated carrots and dressed with a simple vinaigrette dressing. It took me a few years to try making it on my own. Grating carrots on a box grater took a little time, and I'm sure I lost a little skin in the process, so I didn't make the salad often. Process the carrots using the fine (small holes) grating blade on your processor. Then, in 1988, we bought our first food processor that came with grating blades. Grating carrots became quick and easy, and this salad has been a staple in our house ever since. It's great as a starter course, served on a bed of lettuce. 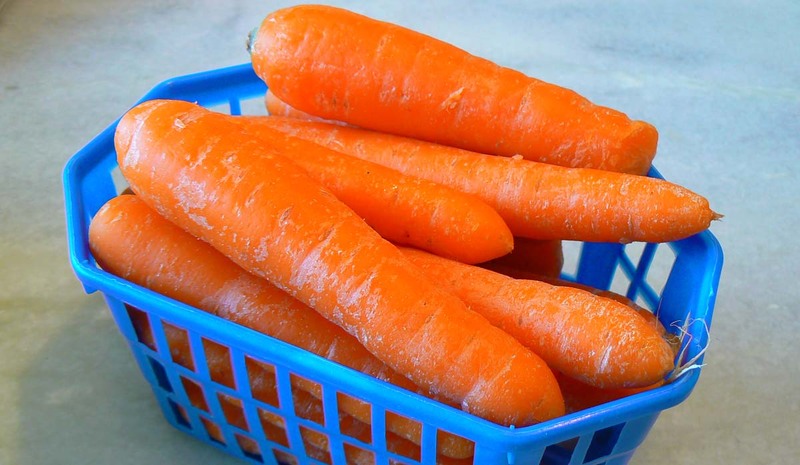 The carrots can also be served with a combination of other raw vegetable salads (dressed beets, celery root, cucumbers, or corn) in what's called une assiette de crudités (a plate of raw vegetables). If we're having cheese at the end of the meal, we sometimes eat the salad as a refresher after the main dish, just before the cheese. All done and ready for the dressing! Can anything be more simple? One tip: I process the carrots on their sides rather than from the ends (see the photo of the carrots lying sideways in the food processor tube). That way I get longer strands of carrot. I think the salad looks nicer that way. So there you have it. My first French Food Standard. Next time (I'm not sure when yet) I'll talk about the standard French dressing: vinaigrette. I've actually begun the cleanup process in the yard. Yesterday I was out in the sun raking up some leaves that accumulated against the house under the deck in front. I also trimmed back the hydrangea and some old sage plants. I burned a pile of yard waste that we had under a tarp since last fall. 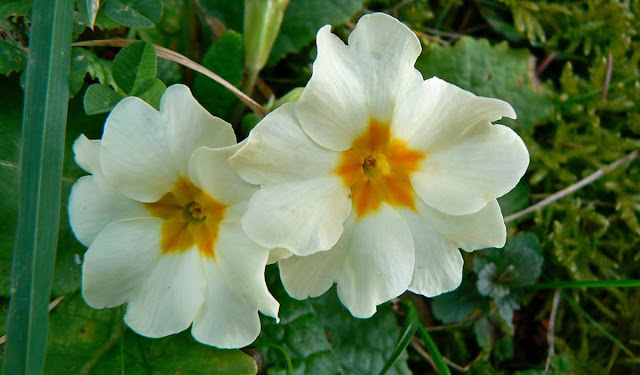 The primroses are beginning to bloom. There is still much to do, and I get a little overwhelmed when I go out and look. But it's only March first, and there will be time to do a little each day. Eventually we'll get it all cleaned up and back under control. By the way, I've changed the commenting format (it's an option that blogger offers). Now you can reply to individual comments by hitting the "reply" button below each comment. Let me know what you think, and if it works or doesn't work for you. As for word verification, I've left it on for the time being. Blogger made it a little easier to read the words. Note: I've already tried my first round of "replying" to comments. I'm not sure I like it for my own replies, since I try to reply to each comment. I'll leave this up for now and wait to see what the regular commenters have to say.